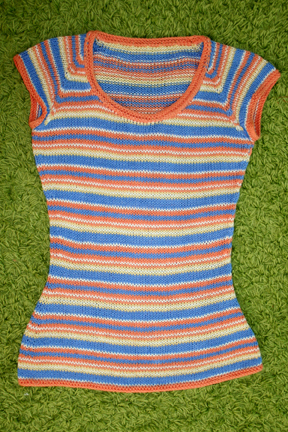 The inspiration for this top came unexpectedly in the form of stripy summer sandals I saw in a magazine. 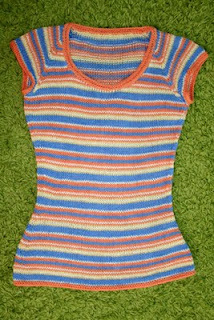 The stripes were so cute - I loved them at once. After playing with colors and a couple weeks of knitting - the top is eventually ready. This weekend I test-drove it during my trip to a mall. The weather was hot but I felt quite comfortable. Now I know for sure - it's true that bamboo helps you tolerate the heat. And I just love my new top.